Identification: This mammal is covered in reddish-brown fur, athough very thinly. They have a very large, block-like head with large teeth resembling that of a beaver. The ears are small and round. Their feet are webbed for swimming. 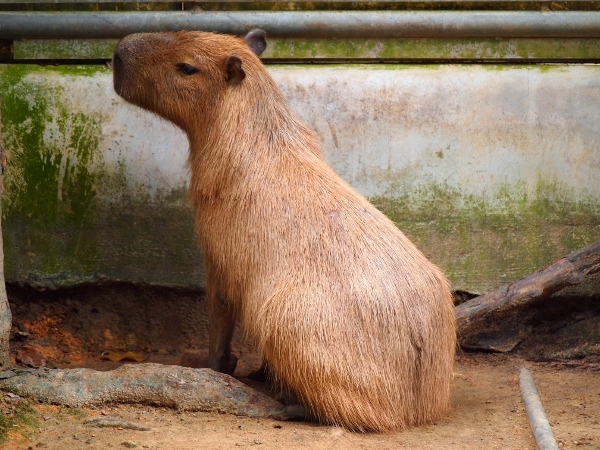 The Capybara is a semi-aquatic mammal and the largest rodent in the world weighing up to 150 pounds and standing two feet tall at the shoulders and four feet in length (Mones and Ojasti, 1986). Size: Up to 150 lbs. Native Range: Its native range is most of South America, except for mountainous areas in the west (Herrera and MacDonald, 1989; Mones and Ojasti, 1986). Table 1. States with nonindigenous occurrences, the earliest and latest observations in each state, and the tally and names of HUCs with observations†. Names and dates are hyperlinked to their relevant specimen records. The list of references for all nonindigenous occurrences of Hydrochoerus hydrochaeris are found here. Ecology: They inhabit freshwater rivers, lakes, swamps, and marshes, grazing on aquatic plants. All types of lowland freshwater habitats including floodplains (Mones and Ojasti, 1986). They require water for drinking, dry land for resting, and grazing lands for foraging (Mones and Ojasti, 1986). Means of Introduction: Capybaras are known to be kept as pets in United States. It is suspected that the Florida population is the result of escapees from a private residence. Status: A population may be established in the Santa Fe River drainage in north-central Florida. Impact of Introduction: Capybaras do very on cattle ranches and may compete for forage with cattle; management for cattle is well suited to their needs (Mones and Ojasti, 1986). There are no known investigations into its impacts in Florida. More than 80 parasite names, including many tick species, are found in the literature associated with Capybaras (Mones 1981 as cited in Mones and Ojasti, 1986). Remarks: They breed all year long based on where they they live latitudinally; the frequency increases at the onset of the rainy season (Mones and Ojasti, 1986). Gestation is about 150 days and the young are born mostly in the fall season (Mones and Ojasti, 1986). One litter is generally the rule; the average litter size is 5 and ranges from 1 to 8 (Mones and Ojasti, 1986). No nest nests are built, but will seek cover from predators to give birth (Mones and Ojasti, 1986). They reach sexual maturity at 30 to 40 kg or about 1.5 years and live to about 12 years of age (Mones and Ojasti, 1986). Herds average about 10 per hectare, but as high as 200 have been reported, and spend most of their core time in about 1 hectare (Mones and Ojasti, 1986). Herds move around adjusting to droughts and floods (Herrera and MacDonald, 1989). Capybaras are selective grazing herbivores feeding on aquatic and semiaquatic plants of the highest protein content (Herrera and MacDonald, 1989; Mones and Ojasti, 1986). Capybaras live in herds from a just a pair to more complex groups of 15 or more (Mones and Ojasti, 1986). They are hunted for their hides, meat, and as vermin in their native South America (Mones and Ojasti, 1986). Herrera, E.A. and D.W. MacDonald. 1989. Resource utilization and territoriality in group-living capybaras (Hydrochoerus hydrochaeris). Journal of Animal Ecology 58:667-679. Mones, A. 1981. Estudios sobre la familia Hydrochoeridae (Rodentia), XI. Parasitos y patologias de Hydrochoerus Brisson, 1792. Lista preliminar. Res. y Com. Jornadas Cienc. Nat., Montevideo 2:16. Mones, A. and J. Ojasti. 1986. Hydrochoerus hydrochaeris. Mammalian Species 164:1-7.